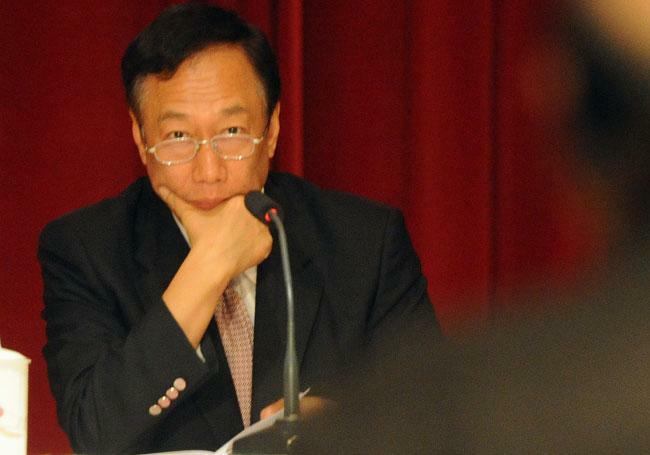 Chief Executive Officer Terry Gou of Hon Hai Precision Industry Co., otherwise known as Apple device manufacturer Foxconn, told customers on Monday to disregard Samsung's recently-released Galaxy S III smartphone and wait for the upcoming iPhone 5 instead. The CEO's bold statement came during Hon Hai's annual stockholder's meeting where Gou mentioned a number of strategies that will allow the company to "beat" Samsung within the next three to five years, reports Focus Taiwan. Apple's iPhone was only mentioned in passing with Gou saying that "the new model will put Samsungs Galaxy III to shame," with the main thrust of the message being Foxconn's ambition to overtake Samsung in seemingly every electronics market the South Korean company competes. To that end Gou noted a strategic alliance with Japanese electronics manufacturer Sharp which will mate cutting-edge technology with Foxconn's prodigious production capacity to yield a product that is three years ahead of anything Samsung can muster. It was revealed in March that Foxconn became Sharp's single largest shareholder after it purchased a 10 percent stake in the Japanese company for $808 million to boost demand for products coming out of the 10th-generation LCD plant in Sakai. That particular factory makes 60-inch and 80-inch class LCD panels and happens to have an exclusive deal with American firm Corning to use its Gorilla Glass in large format applications. Foxconn will begin operating the Sakai factory on July 1 and the Taiwanese company is said to be in talks to buy more Sharp shares though no official statement has been made regarding the purchase. Gou said that he invested in the Sakai plant with his own money so as not to affect Hon Hai's stock and plans to list the Japanese factory on the Taiwan stock exchange within three years. The Foxconn and Sharp collaboration fueled speculation that the companies were looking to vie for orders of Apple's rumored HDTV but the claims have yet to be validated. According to the China Times, it is Gou's lifetime goal to defeat Samsung, a company that he says has "a track record of snitching on its competitors." The chief executive is referring to the whistleblower role taken by Samsung in the European Commission's 2010 flat-panel price fixing investigation of four Taiwanese companies. Gou has been known to be quite outspoken and in May supposedly let slip that Foxconn was prepping its factories for an Apple television order but the report was later denied by the company's PR department.